Directors of the Jewish Community Center. 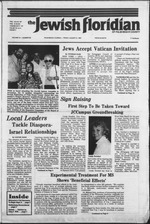 the Pope in Miami on Sept. 11.
the Jewish Community Center new facility will be built soon." Institute of Science in Israel. are less severely disabled by the disease. paign to raise $12.5 million to build the new facility. Scott, JCCampus Capital Campaign Director, at 832-2120.
be dedicated on Sunday, Aug. Registration will be at 6 p.m.
jor goal for this coming year. mission to Israel next spring. tive in the general community. true of news media outrages against Israel. the old title, Lies, Damned Lies, and Statistics. right, yet added them up wrong. American assistance." Yes and no. terms of Israel's own efforts and circumstances. ed this financial distortion on Israel. Rusk, critics of the bilateral relationship. there has been "an unbroken succession of U.S.
case of distortion via selective reporting." over the "violently anti-Israel" documentary. Combining "Our Voice and Federation Reporter"
Erwin H Blonder. Vice Presidents. Barry S Berg. Alec Engelstein. Lionel Greenbaum. Marva Pernn. Marvin S Rosen, Treasurer Helen G Hoffman. Assistant Treasurer Gilbert S Messing. Secretary. relations, or a major setback." world as a righteous gentile. with host Barbara Gordon Green. for the rest of the day (9 a.m.
for the Rabbi Alexander S.
aspects of Israel's national life. ing), the day will come." needs when she needs them. to emigrate to Israel," Mrs.
Hayley Mills and David Soul. turesque journey once a week. to buses for a tour of the city. cholesterol and is low in saturated lat. and the other about ft of dough Divide larger piece into 3 equal pieces. doing in this area worldwide. to pick up their children, Mr.
America, during a break in the Jewish Agency Assembly"
Florida to tell them of Mr.
carbohydrates and has no preservatives. ahead with the Lavi warplane deate and call for a new vote. for the Cop 1 treated patients. Israel Through Dialogue With Leaders In The Fields Of Government. portant component of this group. working on the program and Campaign committees. "America's Most Affordable Spa "
e Knirnm (.Ian kiisht-r ok-jIs dally: on Nhahhai ami Holiday. special Low Rate* for Group* Organization*. and of its Campaign Cabinet. and is active with B'nai B'rith. another. Standing under the "Club Fed"
party on Sunday, Aug. 23 at 11 a.m.
Caribbean Hotel (kosher), Miami Beach. Dec. 17-20, Regency Spa, Miami Beach. Dec. 30-Jan. 1, gala New Years trip. For information and all reservations, call Lillian Schack. Dec. 14, Regency Spa, Miami Beach. cheon at the Royce Hotel. dinner shows, cocktail party, new motel, hostess. 12:30 p.m. at the American Savings Bank, Westgate. mation call Ruth Straus, Somerset 1-123.
ny Girl. For information, call Ruth Straus, Somerset 1-23. Ylskor Services Oct. 3,11 a.m.
ty to to erate frustration. day to keep social contact. 6. Take a vacation together. Palm Beaches to Join It in membership and worship. Please Telephone: 832-0804 9:00 a.m. to 4:00 p.m.
great time at the JCC. main dish, appetizer or salad. Beverages will be served. and directions call the Center. plus dance prizes. Donation: $7. share their thoughts and ideas. &m. There will be music by a DJ, dancing and a cash bar. jnation of $2 includes dips and tips. not meet during the summer. come to the JCC Canastarama. have over our daily living?" 689-7703 and arrange for help. Bennet, Jr. wrote to Rep.
-ach other or to arson. w extent of the damage." next to the Fire Department. rorist actitritfes of the PLO. on June 8, new officers were elected. own Bar Mitzvah in freedom. half years and nine months. .L.M. Aug. 21 7:33 p.m.
tf**^ Aug. 28 7:26 p.m.
i Saturday and holidays 9 a.m., Monday and Thursday 9 a.m.
Avenue and Victory Blvd., Vero Beach 32960. Mailing address: ? Judea has held services at St.
Father John Theodore of St.
Temple Judea, call the office. of Fine Arts in Miami on Sept.
and lunch $25 per person. (iuardian Funeral Home, West Palm Beach. Beach. Levitt Weinstein Funeral Home. Sidney D., of Lucerne Point, Lake Worth. < hapel, West Palm Beach. held out for this possibility. do about the Waldheim affair. Nelson "village" at the site. on what sort of compromise." were murdered by the Nazis. Miami Beach. Mr. Mendel, a native of Longmeadow, MA. Mendel is Dr. Samuel Goldstein, dean of WSSW.